where KHyd is the equilibrium constant for the CO2 hydration reaction, approximately 10-3 at 25°C (1). Carbonic acid dissociates to bicarbonate, HCO3-, while bicarbonate further dissociates to carbonate CO32- (1-4). It is now agreed that, for temperatures below 50-60°C, hydration of carbon dioxide to carbonic acid is the rate controlling step (1-4), i.e. the slowest process. 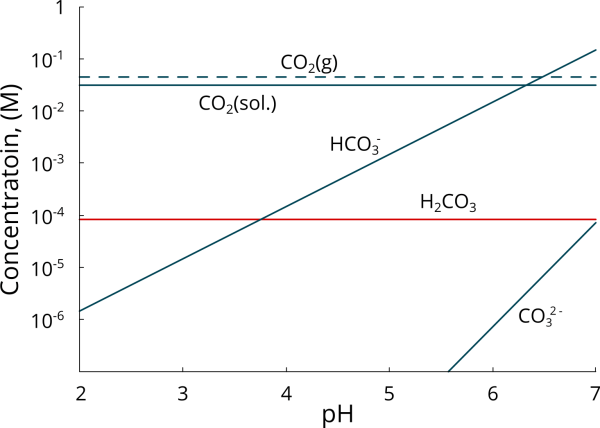 Figure 1 shows the speciation diagram of carbon dioxide in a 1-wt% NaCl solution with a partial pressure of CO2 (pCO2) of 1 bar at 25°C (1). Given that, at a given temperature, the concentration of dissolved CO2 is constant and related to the pCO2 by the Henry’s law, the concentration of H2CO3 is independent of solution pH and proportional to the hydration constant KHyd (1). In contrast, bicarbonate and carbonate concentrations are a function of pH. For the conditions shown in Figure 1, bicarbonate becomes the predominant species at a pH above 3.70, whereas carbonate-carbonic acid equivalence point is approximately pH 7.0 (1). Figure 1. Carbon dioxide speciation diagram for a CO2-saturated aqueous solution; pCO2 = 1 bar, 25°C, 1 wt % NaCl. Nešić argues that Equation 5 is hard to distinguish experimentally from Equations 2 and 3, pointing out that, while HCO3- concentration steadily increases in the 3.50 < pH < 7.0 range, corrosion rates decrease with pH in the same pH range (3-4). However, the reduction in corrosion rate at the open circuit potential could be associated with the formation of a protective iron carbonate film (or other form of protective scale) and does not invalidate the reaction path proposed by Gray and coworkers. Moreover, bicarbonate concentrations increase logarithmically rather than steadily as suggested by Nešić. At a pCO2 of 1 bar, bicarbonate concentrations become predominant at pH > 3.70, with a concentration that is almost 2 orders of magnitude higher than carbonic acid at pH 6.0 and almost 4 orders of magnitude higher at pH 7.0, i.e. the typical pH range of formation water, Figure 1. Regardless of the reaction path, Equations 2 to 5 are all equivalent. In the Bockris-Drazic-Despic (BDD) mechanism, the oxidation of Fe+1 to Fe+2 is the rate determining step (RDS). The BDD mechanism predicts a Tafel slope of 40 mV per decade at 25°C. Above pH 4.0 the anodic reaction can be considered pH independent for the typical pH range of most produced water environments (1-4). The actual reaction path and rate controlling steps are, however, not well understood. The work by Nešić (1, 3-4) and Dugstad (2) can be consulted for more information on this topic. A. Dugstad, “￼Fundamental aspects of CO2 metal loss corrosion part I: mechanism”, CORROSION/06, Paper no 611, (NACE International, Houston, TX, 2006). S. Nešić, J. Postlehwaite, and M. Vrhovac, “CO2 corrosion of carbon steel - from mechanistic to empirical modeling”, Corrosion Reviews 15 (1-2), (1997):p.211-240. M.B. Kermani and A. Morshed, “Carbon Dioxide Corrosion in Oil and Gas Production — A Compendium”, Corrosion 59, (2003): p.659-683. C. de Waard, D.E. Milliams, “Prediction of carbonic acid corrosion in natural gas pipelines”, Proceedings 1st International Conference on the Internal and External Protection of Pipes, Paper F1, (BHRA Fluid Engineering, University of Durham, Durham, United Kingdom, September 9-11, 1975). C. de Waard, U. Lotz, and D.E. Milliams, “Predictive model for co2 corrosion engineering in wet natural gas pipelines”, Corrosion 47, (1991): p 976-985. C. de Waard, D.E. Milliams, “Carbonic acid corrosion of steel”, Corrosion 31, (1975): p.177-181. J.O.M. Bockris, D. Drazic, A.R. Despic, “The electrode kinetics of the deposition and dissolution of iron”, Electrochim. Acta 4, (1961): p.325.